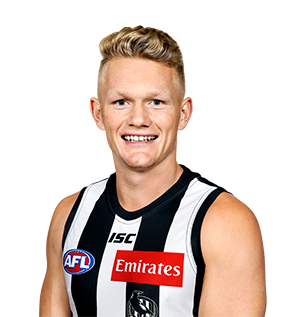 Collingwood midfielder Adam Treloar is likely to be sidelined until late August due to hamstring injuries he suffered in the final quarter of Sunday’s match against Carlton at the MCG. 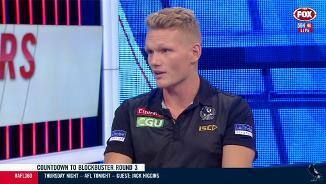 Adam Treloar discusses his massive week of personal form, plus how the team is clicking, and Collingwood's own Humphrey B Bear on the latest Sports Galore vodcast. 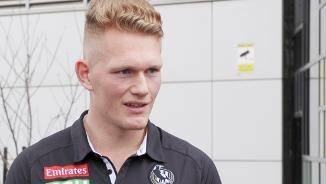 In the opening six rounds of the new season, Adam Treloar has taken his game to another level. 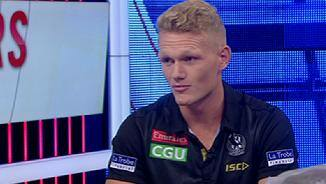 Like teammate Tyson Goldsack, Treloar last year made a remarkably rapid recovery from a serious injury to play a significant role in September. The explosive midfielder had been in sizzling form until the round 14 win over Carlton when he suffered the rare occurrence of hamstring injuries in both legs at the same time, having never previously sustained a soft-tissue problem. Overcame a potentially season-ending tendon injury to play all four finals and resume as a key member of the Pies’ running brigade. Earlier in the year, he’d been ranked as high as No. 7 in the Official AFL Player Ratings. Led the Pies in disposal average (29.5). Previous AFL club: GWS Giants (2012-15: 79 games, 48 goals). Draft history: 2011 17-year-old access selection (GWS Giants); 2015 NAB AFL Draft traded by GWS Giants for No. 9 (Sam Weideman), 4th round selection (not utilised) and 2016 1st round selection No. 2 (Tim Taranto). Player honours: GWS Giants 2nd best and fairest 2015; Collingwood 2nd best and fairest 2016; Collingwood 3rd best and fairest 2017; All-Australian nominee 2016, 2017. Brownlow Medal: 2018 votes 8; career votes 52.